The Mozambiquan capital is well-known for its fabulous nightlife and particularly its jazz clubs, which I had never plucked up the courage to investigate. I had therefore launched a plan to indulge in the inevitable prawn fest on the Saturday evening, then head out to discover those famous clubs and investigate the local marrabenta music, said to be an exotic melange of Portuguese fado folk music, church music and local rhythms. It promised to be a musical feast. Booking into the city’s newest hotel, the Radisson Blu, a note was thrust into my hand, clarifying that we were to be guests during a period of “soft opening”, which, it pointed out, explained the lower rate. I hadn’t known this, but apart from a few unfinished finishes, there didn’t seem to be anything soft about the place at all. In fact, it would be hard to beat. The welcome was as polished as the stainless steel décor. The 12-storey building consists of a hollow triangular tower of glass focussed around a red, green and blue light-streaked staircase. All the rooms offer a sea view of some kind or other; all are modern and light with all the trappings of a five-star hotel and service to match. Our room looked out to the west along the coast and down the estuary into the port. High up on the right, we could see the newly-refurbished Polana Hotel and below us, the Avenida Marginal promenade bustled with evening revellers, on route for their Saturday night entertainment. I had written in advance to the hotel for advice on music venues and received a very detailed reply from Ivan Laranjeira, the Guest Relations Manager, offering numerous options for a Saturday night. He particularly recommended the Kamfumo Bistro, also known as Chez Rangel, in Maputo’s signature railway station, and Modas Kavalu, on top of the Teatro Avenida, which was, he said, quickly repositioning itself as one of the most influential venues on the Maputo musical scene. On check-in, we asked how we should get to Kamfumo, only to be informed that it was closed, so we opted for the second suggestion. But that was closed too. Ivan’s third choice, the Gil Vicente Café Bar, promised lively jam sessions and ‘karaoke’, so we decided against that and threw ourselves into the search for crustaceans instead, discovering in the process that yet another Maputo landmark, the Marginal’s Costa do Sol restaurant, was also currently not functioning, although it is still unclear why. There was a rumour that the old icon is to be turned into a hotel school but, on investigation, the sign on the fence merely said it was being refurbished. Defeated at every turn, we decided to beat a thirsty retreat to our hotel bar and then dine in-house. It would turn out to be a very wise plan. I have never been a big barracuda enthusiast, always finding it to be dry and rather tasteless, but at the blue-lighted Filini Restaurant I underwent a Damascene moment. In Carpaccio form, barracuda takes a lot of beating; it is soft, juicy and with the mild zing attributed to it by the chef, it was somehow reminiscent of South American ceviche. With it, in the mixed hors d’oeuvres, were four stupendous prawns, roasted peppers, a shrimp salad, grilled calamari and some clams. My colleague Kevin followed his enthusiastic attack on the starter with another ten prawns, whilst I went for a crab pasta, topped with half a crab, a garnish that was almost a meal in itself. Kevin then braved a crème brulée, which impressed a keen dessert critic. Withdrawing to the balcony for a nightcap, sheltered from the on-going drizzle, we watched and heard Maputo at play. It might not have been the sound of a jazz band but it was lively enough – the hum of vehicles enveloped by soft rain, the swaying of the palm trees in the wind and a gentle pulse of African rhythms from the surrounding restaurants. Sunday morning’s breakfast was a six-star affair and sported more berries, pastries, juices and seeds than you could throw a stick at, followed by the perfect scrambled egg. We had nothing planned, so took a drive into the downtown Baixa area for a forlorn look through the closed glass doors of the station’s Kamfumo Bistro which would certainly be an impressive venue when open, before turning our attention to the city’s other landmarks: the Botanical Gardens, the Iron House and the Municipal Market. Like almost everything else (apart from the potholed streets) theMercado was under reconstruction. We lunched in the rain at the Polana, made our way through more rain to the Marés shopping centre where we took coffee at Beatles after a rowdy game of ten-pin bowling with the local Sunday crowd, ending up some hours later at Miramar, opposite the Radisson, for a few 2Ms with prawn cakes and seafood samosas. Miramar was already rivalling Costa do Sol when the former was still open. Now it seems to be cementing its position and proved another highlight of a wet weekend. Maputo is a refreshing break away from home but be sure to check what’s operating before you make too many plans or you, too, might end up ten-pin bowling instead of tapping your foot to some lively African rhythms in a splendid art deco bar. So, musically I guess we blew it. No jazz, no blues. But our stay at the Radisson Blu blew us away. Especially the blue-lighted restaurant. 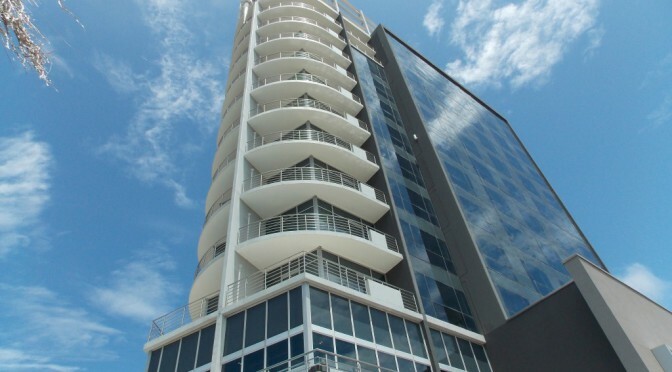 Radisson Blu, Avenida Marginal Maputo, Mozambique. 154 exceptionally well-appointed rooms and suites. Free WiFi. Swimming Pool. The superb Filini restaurant is a highlight. The Palmeira lounge serves light meals and the Oceano Bar is open as late as 2am when the hotel is busy. The hotel offers a wide range of special deals for weekends, long stays and even Valentine’s Day, so send an email and see what they can do.